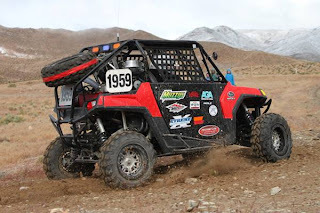 Yerington, NV – May 29, 2011 — The Yerington 300 is VORRA’s signature desert race to start off their Desert Season. In keeping up with VORRA’s theme to change things up this year the loop course was laid out to have a traditional 57 mile loop with a short cut to knock off 20 miles and racers were to run 3 long laps and 3 short laps. The first lap was to be a long lap with the order of the remaining laps at the driver’s discretion. Wes Harbor’s idea behind this was to mix it up so that no one knew the position of anyone else during the race. This change up was received with positive feedback as commented by many of the racers at the awards banquet Sunday evening. In keeping with the unpredictable weather patterns of Northern Nevada we arrived at Yerington on Friday for our pre-run and were greeted with strong winds and overcast skies with temperatures in the low 60’s. The forecast for Race Day was showers but when we awoke Sunday morning it was a winter wonderland of snow and freezing temperatures. Our start time was scheduled for 8:00 am but was pushed back to 8:30 in hopes of a break in the weather. The Class 9’s, 11’s and UTV’s were the first off the line in that order one minute apart. The one positive from the previous night’s rain and current snow conditions was that desert dust would hopefully be eliminated from the days racing. With 8 racers ahead of us and 49 behind us it was going to be a fun day. Except for the usual rocks, deep whoops, narrow trails and unexpected snow we were off to a great start. At the end of lap 1 we were first in our class and after a quick pit stop we headed out only to find that the beginning of the course had changed dramatically due to the 49 racers that started behind us. The ruts became deeper and more challenging for the smaller classes. Midway through lap 2 one of the ruts kicked our rear end up into the air and we landed on a rock in the center of the course. Unbeknownst to us there was considerable damage to our UTV. At approximately mile 51 we lost our transmission and were out the race. VORRA’s swift response in removing the drivers kept us from having to endure the constant snow flurries that were passing through during the day. Unfortunately, our car was stuck in a narrow canyon and we were forced to extract the car at the end of the race. Upon inspection back in the pits we found that the rock hit we took had torn through the skid plate leaving a crack in the transmission case draining the oil and eventually destroying the transmission. We would like to thank XMF and Walker Evans for a great suspension that was helping us handle the tough desert terrain and strong Holz Stage III motor that had us out to a commanding lead in the UTV class until our unfortunate incident. Next up on our race schedule will be the VORRA USA 500 desert race July 15th – 17th. 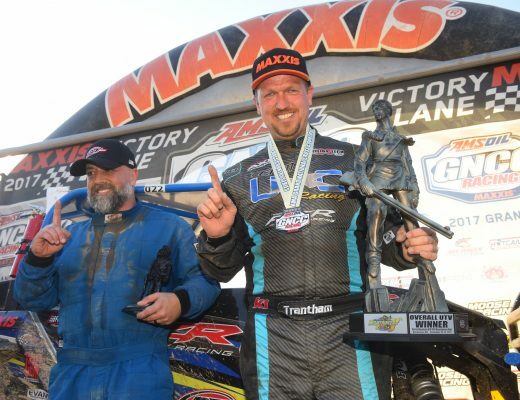 Thank you to our sponsors: XMF (+8 suspension & roll cage), Walker Evans shocks, Sapa Extrusions, Cal Custom Trailers & Power Sports, Pape Rentals, Muzzys Exhaust and Hiper Technology carbon fiber racing wheels.